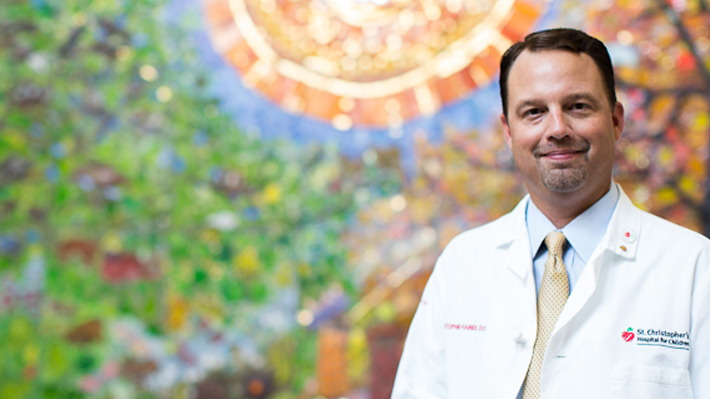 Christopher Haines knows how to stay busy as the chief medical officer of Children’s Specialized Hospital and associate professor of pediatrics and emergency medicine in Drexel’s College of Medicine. He joined the team at Children’s Specialized in 2013 after serving as the director of emergency medicine and the critical care transport team at St. Christopher’s Hospital for Children. He also actively participates in academic research. Somewhere during all this, he was able to complete his MBA in Healthcare Management at LeBow. “I don’t find much time to sleep, but it’s worth it because I love my job,” said Haines, who addsed that the flexibility afforded through the MBA’s hybrid online delivery format enabled him to participate in the program despite his many responsibilities. At St. Christopher’s Hospital, in addition to his administrative duties, he spent about 50 percent of his time as an attending physician, tending to his patients’ needs. He discovered his aptitude for administration while serving as chief resident, and said he was making the greatest difference when he was helping the hospital to better serve more patients. Haines says his pursuit of his MBA definitely impacted his ability to take on the new role as chief medical officer. The program also supported his desire to help drive innovation in his field. The same Drexel LeBow MBA, featuring the same faculty, offered completely online at your own pace and on your schedule. Ranked a top online MBA programs in the world by Financial Times.